June 21 was declared as the International Day of Yoga by the United Nations General Assembly on December 11, 2014.Yoga, a physical, mental and spiritual practice having its origin over 6000 years ago in India, aims to integrate the body and the mind. 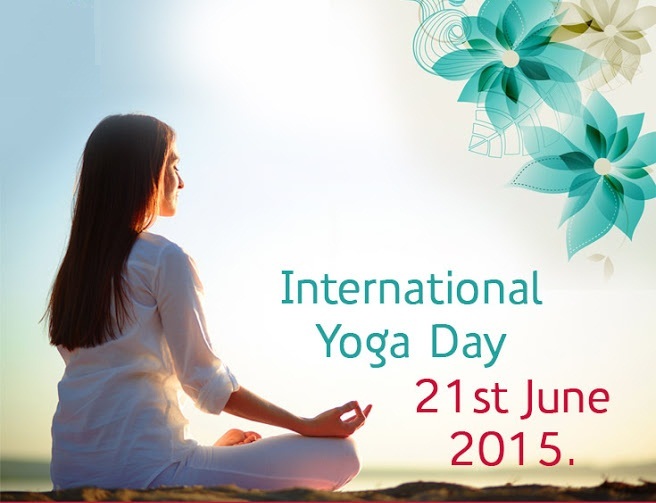 We also attend yoga day for aims to integrate the body and the mind. I this occasion PM will be present at the 35-minute public demonstration that includes civil servants and students, many of whom have been ordered to practice their chaturangas and downward dogs ahead of the event. On Sunday 45,000 people will attempt to break the world record for the single largest session of yoga on Rajpath, a ceremonial avenue in New Delhi that connects the president’s palace with India Gate. At Rajpath, 1,400 meters of the road will be cordoned off and carpeted, according to authorities. "Yoga for harmony & Peace" The two-day conference titled ‘Yoga: A Science for World Peace’ was organized by The Art of Living .Ahead of this Sunday 192 countries celebarte international yoga day “Yoga makes you like a child again. When there is yoga and vedanta, there is no lack, impurity, ignorance and injustice. We need to take yoga to the doorstep of everyone and free the world of misery. Now, official recognition by the UN would further spread the benefit of yoga to the entire world.